Nighttime in the Santa Cruz mountains. A mountain lion sprawls on the forest floor, happily noshing on a freshly killed deer. The wind in the trees is the only sound, the moon the only illumination. Then political commentator Rachel Maddow's voice fills the clearing: "Last Friday, three days after Bobby Jindal quit . . ." The lion lifts its head, and its eyes, glowing in the scant light, look right toward a hidden camera. Then the creature turns tail and flees. It's gone before Maddow even finishes her sentence. Over the course of several nights, this scene repeated again and again at different locations in the mountains of central California. Unbeknown to the big cats, scientists from the University of California at Santa Cruz had installed motion-sensitive cameras at "kill sites" – spots where the lions stash the carcasses of their prey so they can extend the meal for days. Whenever one returned to its kill, the camera would switch on and a clip of a political talk-show host would begin streaming from a concealed pair of speakers. The lions were subjected to the strident tones of Maddow, Glenn Beck, Amy Goodman and Rush Limbaugh, as well as the less-upsetting sound of Pacific tree frogs croaking. Few mountain lions (which are also known by some Californians as pumas) reacted to the frog recordings. Yet the moment they heard a human voice, more than 80 percent of the big cats fled the scene, according to a study published Tuesday in the journal Proceedings of the Royal Society B. "It's fun to watch them bound away, tails flying," said Justine Smith, who helped orchestrate the bizarre experiment. But Smith, a UCSC ecologist by day, didn't inflict the horrors of political commentary on defenseless animals for mere amusement. She was trying to understand a potent and profound new force in the lions' world: fear. Mountain lions are apex predators, positioned at the top of the food chain. Under normal circumstances, little frightens them. Rather, they are the ones who generate terror. Prey species – deer, raccoons, even coyotes – must keep their wits about them to avoid becoming a lion's next meal. Wariness of predators makes these other species spend less time eating and more time hiding, watching or scurrying out of view. The cascading effects of these behavioral changes can reshape an entire ecosystem: Plants that were once bitten down to stubs by grazing deer may rebound, small critters can find new homes and hiding spots in the restored foliage, the course of a stream may shift, the composition of the soil itself may change. Ecologists call this phenomenon the "landscape of fear," noting that the simple possibility of predation plays an important role in how animals interact with their world. "Any predator is only ever going to eat some of its prey," Justin Suraci, an ecologist at University of Western Ontario and a co-author on the mountain lion paper, told The Washington Post last year. "But it's potentially going to scare all of its prey, and cause all of its prey to change its behavior all of the time." This fear-infused landscape shifts when humans enter it. We are "superpredators," Smith says, and she and her colleagues wanted to know whether humans have the same terror-inducing effect on mountain lions that these apex predators have on their prey? "We know they don't like being around our developments, but it's hard to know if they actually perceive humans as a direct threat," Smith said. 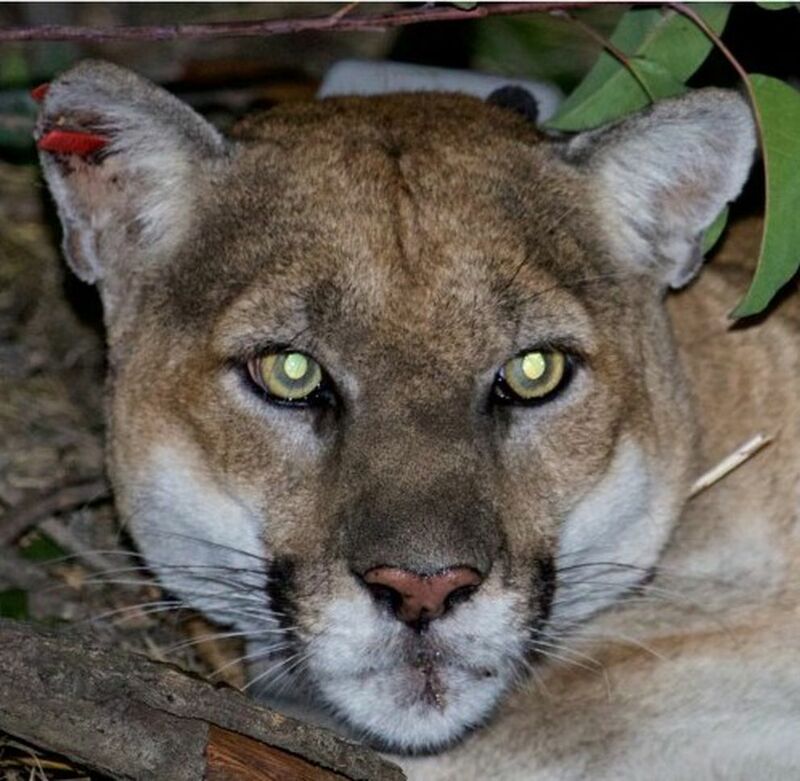 And "they really should," she noted – humans and human impacts (car collisions, habitat loss) are the leading cause of mountain lion deaths in Southern California. "We wanted to test directly if pumas fear the most benign form of human disturbance, our sound," she continued. "That would tell us if they actually fear humans themselves." The results were pretty unequivocal. Nearly every lion that heard a political pundit pontificating ran away immediately, and more than half of the frightened lions never returned to finish their meal. The reaction was the same regardless of whether the lions heard a male or female voice, or whether the speaker was a liberal or conservative. "Pumas are nonpartisan in their hatred of American politics," Smith joked. The controls, who heard only the benign frog noises, were far less likely to flee and spent more than twice as much time eating. "Instead of the mountain lion instilling the landscape of fear, it's a human playing that role," Smith said. " It adds this element to the ecological community that's throwing everything off." In a previous study, she and her colleagues found that mountain lions spend less time at kill sites when they're around humans – but they kill more often. As many as 36 percent more deer are slain by lions in areas with high levels of human activity. Now the scientists are investigating what cascading effects this might have on the rest of the ecosystem. There's an important lesson in all this for conservation planners, Smith said. "When we're trying to achieve coexistence between humans and large carnivores we generally focus on the presence of these animals and not necessarily their behavior," she said. Mountain lions are protected in California – they can't be hunted or transported except under very specific circumstances – with swaths of the Santa Cruz mountains designated as state parks and open-space preserves. That may be enough to keep the animals alive, but it doesn't help establish what Smith calls "coexistence in a more holistic sense – not just making sure that they're there, but making sure they're a healthy and functional population." To do that, humans need to keep in mind that we're scary. Especially when we're talking about politics.